Today we celebrate the 25th anniversary of the fall of the Berlin Wall with a look at an all-star concert that took place at the site of the Berlin Wall in the summer of 1990, just months after the wall fell on November 9, 2014. This article by Peggy Fay Albano is done in conjunction with The River of Rock, and is published in along with an album review of The Wall 1979 album on Classic Rock Review and of the 1982 Pink Floyd The Wall classic movie review on Big Blue Bullfrog. Live In Berlin one of my favorite concerts. I have always liked the music of the album The Wall, so imagine my joy when I received it as a Christmas gift a few years back. I hope this review does it justice. Pink Floyd staged an elaborate tour to support the album The Wall in 1980 and 1981, which ultimately lost the group a large sum of money. Roger Waters left Pink Floyd in 1983 and launched a successful solo career through the late 1980s. In a 1989 interview, he stated that the only way he would resurrect a live performance of The Wall was “if the Berlin Wall came down”. Just months later, that is exactly what happened. The live concert took place on July 21, 1990 with a video and live album of the concert released the following month. The event was held on vacant terrain between Potsdamer Platz and the Brandenburg Gate, which had been a “no man’s land” between East and West Berlin for over four decades. Initially, the producers were concerned that the area might be laced with land mines and they did an extensive sweep of the area which led to the discovery of a cache of munitions and a previously unknown SS bunker. Part of the actual Berlin Wall was kept in place and acted as a security fence behind the stage. Approximately 350,000 tickets were sold with many more attendees coming in after the gates were opened. The production was designed by Mark Fisher and Jonathan Park, who designed a custom stage and production area highlighted by a 550-foot-long, 82-foot-high wall which was methodically built with large Styrofoam blocks during the first half of the show. The production also used elaborate lighting, giant inflatable props and a “hotel room” staging area high up on the wall to reflect the main character’s (“Pink”) long psychological breakdown in this room. While strongly based on the 1980/81 Pink Floyd concerts, this one-time 1990 show had several enhancements and unique features. Of course, the most unique of these features was the all-star ensemble of popular singers and musicians that participated in the show. 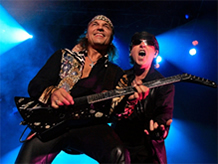 The show started in dramatic fashion with a dramatic performance of “In the Flesh?” by Scorpions, a native German band that had been performing almost as long as the Berlin Wall had been standing. The group arrived on stage in a stretch limo to the delight of the rabid crowd. Waters first appearance came during a duet with Ute Lemper on “The Thin Ice”, which morphed into the popular “Another Brick In the Wall” sequence, where it is almost impossible to not keep time with this great music. This sequence includes a sax solo by Garth Hudson of the Band and an animated performance by singer Cyndi Lauper and keyboardist Thomas Dolby during “Another Brick in the Wall, Part 2”. Frankly, this is one of the few performances that I didn’t really like. Although Lauper’s singing was good, her jumping around seemed a bit over the top. Hudson returned to play accordion on “Mother”, along with other members of The Band singing backup behind Sinéad O’Connor, who does a great performance. Actually, the video includes a rehearsal performance from the night before the show, as there were some technical difficulties during the actual concert. “Goodbye Blue Sky” is performed by Joni Mitchell along with a great performance by flutist James Galway. The medley “Empty Spaces/What Shall We Do Now?” is performed by Bryan Adams along with a guitar solo by Rick Di Fonzo, and is a real crowd pleaser. All during the early part of this show, a wall is being built which obscures more and more of the stage. 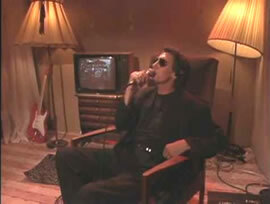 On “One of My Turns”, Waters appears through a window high on the wall which is set up like the hotel room used in the 1982 film Pink Floyd The Wall. Here Waters proves that he can act as well as sing, and the sad and dark melodies continue through “Don’t Leave Me Now” and “Another Brick in the Wall, Part 3”. Waters returns to ground level to sing the melancholy “Goodbye Cruel World”, where it seems that “Pink” has given up and at the end, the very last brick is placed in the wall. Act II begins with a rather odd performance of Paul Carrack doing “Hey You” completely behind the wall, while still facing the unseen audience on the other side. Through the next several tracks, which follow the sequence of the album, Waters and crew perform songs of isolation (“Is There Anybody Out There?”, “Nobody Home”, “Vera”) all done behind the large wall. Starting with “Bring the Boys Back Home”, which is performed by a band of the Combined Soviet Forces, certain performers come out in front of the wall for theatrical effect, while the vast amount of musicians played from behind the makeshift wall. .
“Comfortably Numb” is one of my favorite performances, as an ambulance arrives onstage carrying Waters who sings along with the legend, Van Morrison. I can understand how someone (in the situation expressed here) would be feeling comfortably numb. 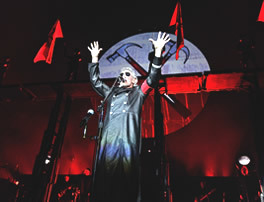 The Scorpions return for the reprise of “In the Flesh” and “Run Like Hell”, where Pink’s illness has him imagining himself as a surragate (Nazi like) fascist in front of the crowd. “Waiting For the Worms” is a spectacular performance before the extremely short “Stop” (in fact, I missed it the first time). The climax of the whole show takes place during “The Trial”, which features Dolby as the School Master, Lemper as the Wife, Marianne Faithfull as the Mother, Tim Curry as the Prosecutor, and Albert Finney as the Judge. A song like no other, this highly theatrical song climaxes with the ensemble and entire crowd shouting “Tear Down the Wall” before the huge structure crumbles in orchestrated waves. This article was done in conjunction with the River of Rock. Owned and operated by 33 Dimensions LLC, River of Rock is a network of music and entertainment websites. For more information or interest in submitting a review, please contact ric@modernrockreview.com.